aw, i love taking pictures with nicholas. when we went up for renegade sf, our photographer mentioned he was going to be up there as well so we thought a photo shoot would be so fun in san francisco! we shot at the botanical gardens, it was a lot of fun and christian cruz is legit! he is one of the nicest guys around and he has a great eye for photography. 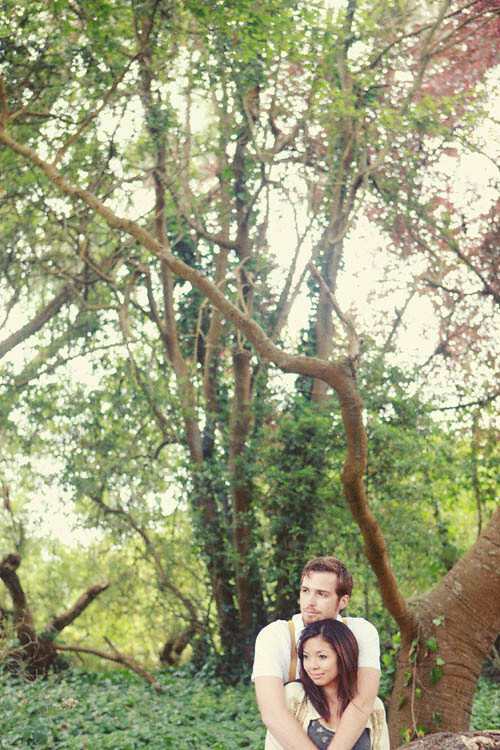 i love how he captured and framed us amongst the nature and trees. so we tried to coordinate our colors for our outfits: grey, white, and deep yellow, my favorites! doesn't nick look handsome? "whoa it's like my kiss is blowing you away!" okay back to wedding planning! for the wedding decor. i think it'll be cool. This is such a great photoshoot. I think the second pictures is my favorite though. You guys are so stinkin' cute! And I LOVE the one of you two standing on the benches...too cute! beautiful photos! love christian's work. awww! too cute, danni! love them all. 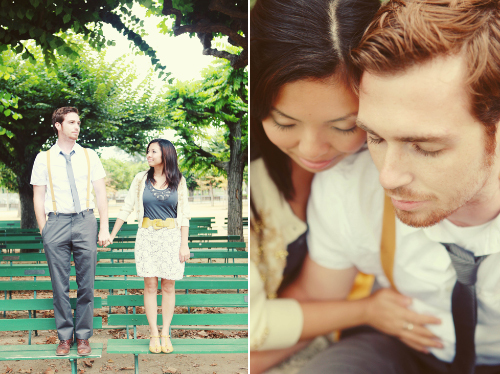 Danni, these pictures are so beautiful and it is obvious that you guys are SO in love! Great choice with the grey, white, and yellow...my favorite! so romantic! you look so in love! So amazing! You guys are so cute together and I love his suspenders. Beautiful photographs! wish this photographer could do my trash the dress shoot! Oh, how cute! And they're going to be such great keepsakes. Oh...what beautiful photos. You two are so cute! Aw you guys are so cute! I love the botanical gardens! Evan proposed in the Japanese tea garden on top of the steep bridge. I love that park!! And genius on the color combo. These photos are stunning. I love the one of his kiss "blowing you away!" Danni, this shoot is gorgeous -- what a spectacular setting! you two are so adorable. what fantastic photos!! going to check out more.. Absolutely stunning! I can hardly wait to see what the wedding photos will be like!!!! just beautiful! 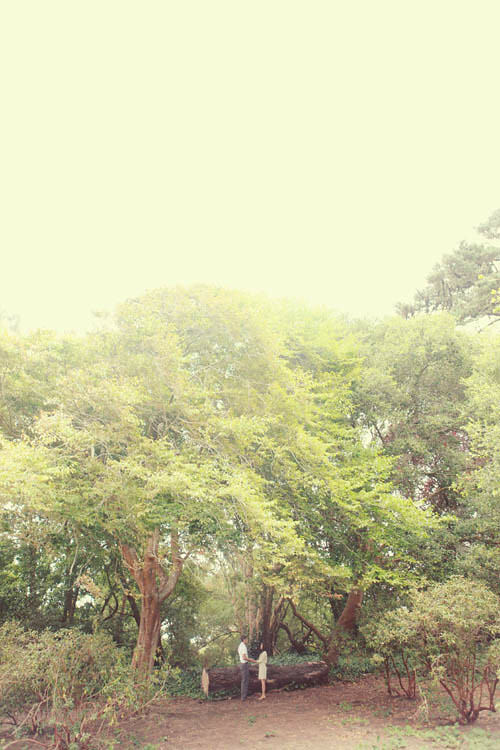 I love how the photographer used the trees as frames-- genius! and nick's comment is so cute. boys are funny. can't wait to see the inspiration board! I know it will be fantastic. these are simply *gorgeous* photos! you really picked an amazing photographer. it also helps that she's working with such a photogenic couple. :) i also loved that your outfits coordinate, but aren't all matchy-matchy. love it all! i love these pictures, your outfits, the location, your expressions, all of it! so adorable and lovey and i adore it. Hi Danni - just love these shots! You guys are stunning and very photogenic. these are wonderful; i love them! 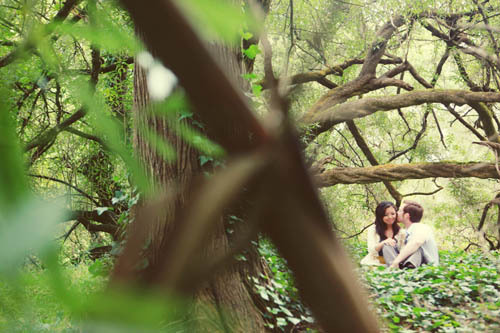 Engagement shoots are not very popular in Germany (at least not that I know of), but I kinda want one too someday now that I've seen so many beautiful ones on blogs. these photos are so cute! I love the lighting and the framing of the trees and nature. Supercute clothes too. :) You both look so happy and content. Has to be the loveliest shoot i've seen in a long time - wonderful! Beautiful photography, and you guys make a perfect couple!! Nick's favorite photo is my favorite too! It does looked like you were blown away, like literally! You two look so adorable. I have been following your blog for quite some time now and every time you post something about Nicholas or the wedding, it makes me happy! No joke. You two are such a beautiful couple. Love the pictures! you two are so sweet. =) i love it! You guys are tooooo adorable!